So, a little while back The Cinnamon Snail – ever so creative gurus of vegan food truck cuisine – had a special breakfast item: Bourbon hazelnut pancakes with cranberry orange relish, pine nut butter, & dark beer syrup. I KNOW, RIGHT?! WOW! Missing out on the special inspired me to get into the kitchen on one otherwise lazy football-filled Sunday. Here are the results. 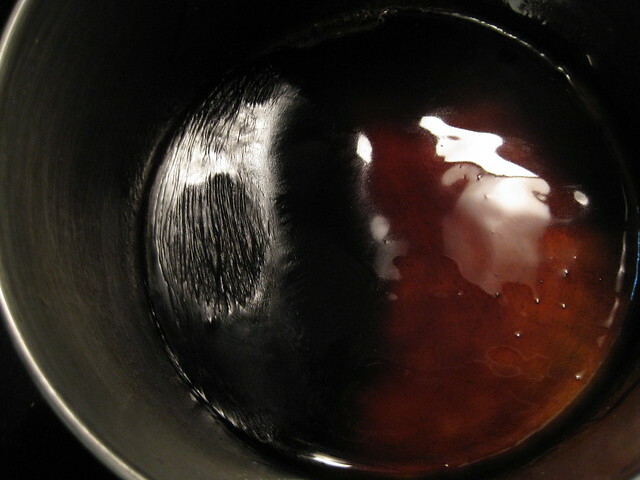 I started with the syrup, since it takes some time to boil down. I made syrup infused with Maui Brewing Company’s Coconut Porter, following the same method I used for this glaze. Basically, a 3:1 ratio of maple syrup to beer, boiled down to a consistency that’s right for you. For the pancakes I once again turned to the Veggie Works cookbook. I used the oatmeal pancake recipe, making a few modifications. Cook the oats in the water for 3-5 minutes, covered. Mix the remaining dry ingredients together in a bowl. Add the juice, almond milk and Earth Balance to the oats and mix well. 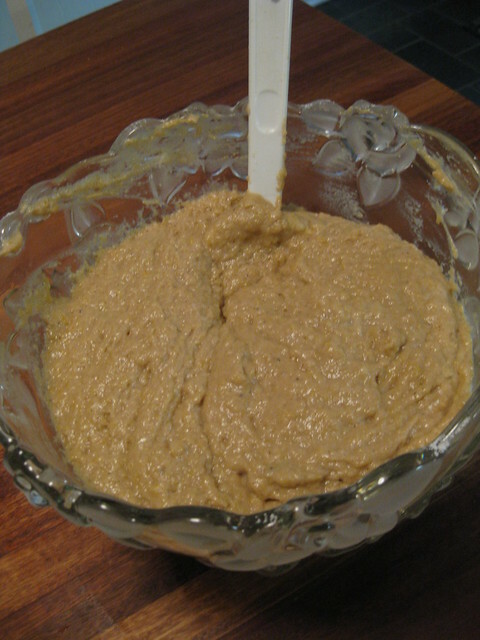 Pour the oatmeal goop into the flour mixture and beat into a batter. Heat a skillet, oil and cook ‘m up. I paired the pancakes with some Buffalo Trace-braised coconut bacon (by the way, very lame that Maker’s Mark is watering down their bourbon), made with applewood liquid smoke. 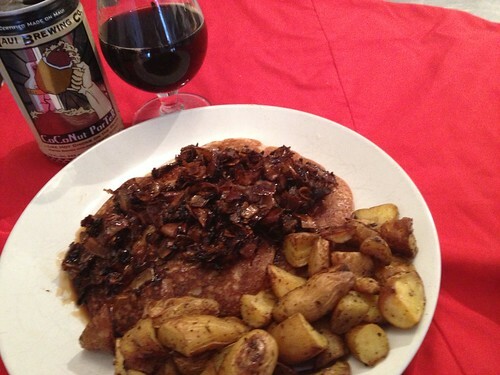 I also added a little bourbon barrel-aged Worcestershire Sauce that Kevin hooked us up with. Meanwhile, I chopped up fingerlings I picked up at the Farmers’ Market and roasted them with coconut oil, pepper, smoked salt and some Pain is Good jerk seasoning. The results were awesome. The syrup had the sweet barley flavors of bourbon and a slight burnt flavor that was distinctly like the toasted coconut notes that come from aging in a charred oak barrel. Combining this with the bacon and the tropical fruit of the pancakes brought the flavors out even more. If I were to make this again I would probably add some actual fruit (pineapple?) and top with some crushed, toasted macadamia nuts. Pair it with Coconut Porter or your favorite breakfast beer and start the day off right. Enjoy. After mentioning my plans to brew a pumpkin barleywine to some friends, they generously gave me a pair of pumpkins from their garden. Unfortunately, I never got around to brewing the barleywine. Instead, the pumpkins were used as decorations for Halloween. 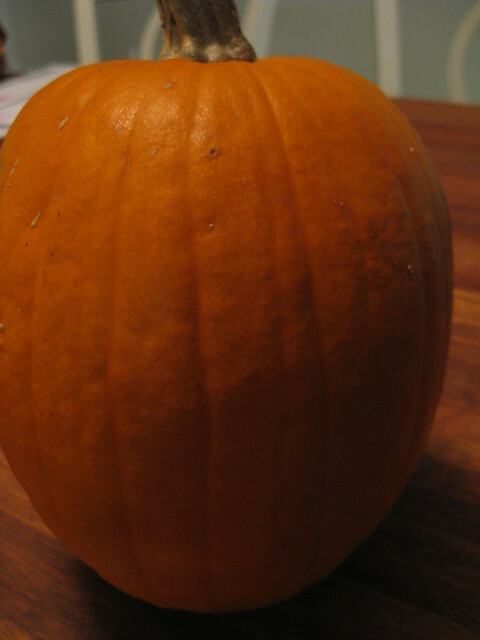 A few days after Halloween, I noticed that one of the pumpkins was starting to rot. Rather than see them both go to waste, I decided I needed to do something with the remaining pumpkin. I haven’t had the time to brew lately, so I decided to use the pumpkin in a bread recipe. Last fall, I brewed a pumpkin porter and added roasted pecans to the secondary. The beer turned out great, I think. The roasty, chocolate flavors of the porter went nicely with the nutty flavors of the pecans and the velvet texture of the pumpkin. With that beer in mind, I came up with the following pumpkin bread recipe, which uses a homebrewed porter (similar to this one, but without the smoked malt) as an ingredient in the bread and in a sweet, maple glaze. If you are using fresh pumpkin, begin by cutting off the top of the pumpkin, remove the “guts,” then cut the flesh of the pumpkin into 1″ cubes, removing the skin as you do this. 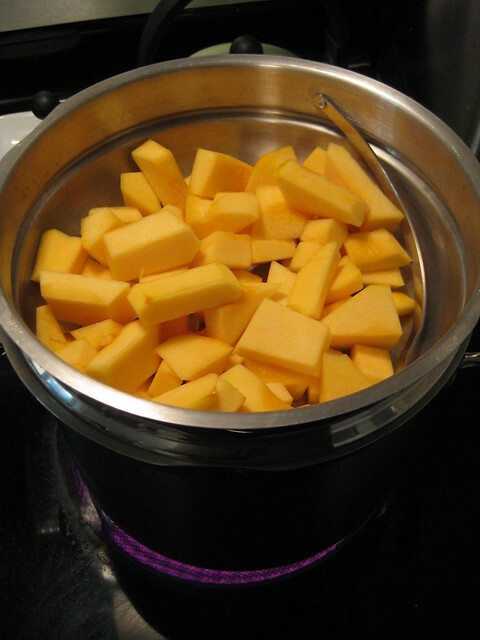 Place the chunks into a steamer basket and steam for about 25 minutes until the pumpkin is soft. Divide the mixture in half and place into two, well greased and floured 9 x 5 bread pans. Bake for 45 minutes, or until a toothpick comes out clean. When the bread is done, let cool while you get started on the glaze. To make the glaze, heat the Earth Balance in a sauce pan. Add the beer, sugar and maple syrup to the pan and bring the mixture to a boil. Turn down the heat and allow most of the liquid to boil off, stirring often. The idea here is to get the malted barley sweetness from the beer, as well as some caramelization of the sugar. The glaze should be thick, but runny enough to coat the bread. Do not allow this to cool. With a pastry brush, coat the loaves of bread immediately. Let the glaze cool and harden on the bread. I think topping this with crushed, toasted paeans would be the perfect final touch. Unfortunately, I didn’t have any on hand and Jaime is not into baked goods that have nuts in them, so I didn’t bother running to the store to get some. Anyway, this came out really well. 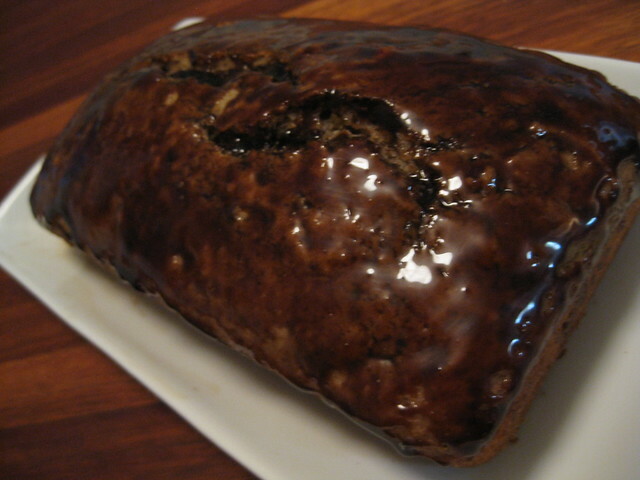 The bread is very moist and fluffy, not overly sweet and has some nice caramelized sugar flavors from the glaze. The spices are delicious – pumpkin pie spice without being too aggressive. A great way to use up some Halloween pumpkins!